(MoneyWatch) COMMENTARY I watched a re-airing of a CNN report the other night about the difficulty that activated National Guard and Reserve veterans are having finding or returning to jobs when they come home. Some units are seeing unemployment levels of 30% -- three times the current national rate -- or more. Many vets are volunteering to return to combat just to keep a paycheck coming. The idea that coming home could actually be more difficult and stressful than returning to war is heartbreaking and shameful. Some servicemen and women are living off savings that might last no more than a month, or scraping by on income from a spouse in a once two-income family. Some who manage to get work are taking jobs well below the level of the positions they had earned before deployment -- some at near poverty wages -- out of sheer desperation. One of the soldiers profiled in the story, a father and grandfather with years of management experience, had to trade in his Army uniform for a pizza delivery uniform and try to support his family on tips. According a Workforce Management online survey, a shocking 65% of employers would not hire an active Guard member or Reservist. Despite the USERRA guidelines, created to protect against hiring or re-employment discrimination, employers worry that they might not be able to afford the cost of absence for training obligations or deployment, or be able to re-hire a returning veteran. Believe me, as a small business owner, I understand. The smaller the company, the more difficult, or even impossible, it can be to function in the extended absence of a key employee. In my company, we do not have a single position that we can manage without for long. But I would never turn down a service person -- much less a returning combat veteran -- for an appropriate job opening for which he or she would otherwise be a qualified and desirable candidate. On the contrary, all other things being equal, I consider military service to give a prospective employee an edge. Over 40 years, my family has been privileged to hire many Guardsmen, Reservists, and active duty retirees, and they have made valuable contributions to our businesses. More often than not, they are among the hardest-working, most dedicated people around, especially when they need an opportunity and someone gives them one. But putting flag waving and good intentions aside, there is no denying the reality and risk. 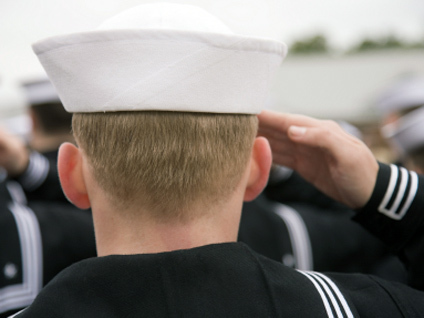 Service people may have to leave their civilian jobs for short or long periods of time, which can clearly create difficulties for a small business. But --legally and (in my opinion) morally -- it can and should not put a candidate at a hiring disadvantage. Hiring, like any major investment, is one of the many risks we take every day. Expensive machines break and shut down production lines. Products fail. Expensive marketing programs flop. Many employees don't work out at all. But most of us accept those risks when we believe in what we're doing. If a National Guard member or Reservist is a great fit for a job, you shouldn't base your decision on what may or may not happen. The employee might get called up some day or might not. We typically don't pass on good decisions based on what "might" happen. - Larger companies have fewer excuses: They have more resources and more flexibility to hire, reassign or otherwise adapt to changing personnel situations. I can't imagine a company of, say, 100 or even 50 people that couldn't deal with the risk of hiring a National Guard member. Though perhaps not ideal, depending on the job and skill set, in many cases it is possible to hire temporary labor, being upfront about the fact that the engagement might end if and when the permanent employee returns. Might sound improbable to some, but in a tough job market, a temporary position can be attractive to good people. It provides income, possible opportunities, references, connections, and the benefit of job continuity (we all know it's harder to get a job when you don't have one). Worst case scenario, the USERRA guidelines do have provisions for demonstrable hardships. They are limited and the burden of proof is on the employer, but if you are in a truly impossible position, can't find any place for the returning employee or help him or her secure a similar job, and are in genuinely dire straits, you might be able to make your case for a hardship exemption. Again, there are no guarantees in anything, no zero-risk investments, but that's business. Our country rightfully prohibits employment discrimination on the basis of race, religion, gender, age, disability, pregnancy and sexual orientation. Few employers would risk the penalties of blatant disregard for these high-profile protections, yet many are clearly unafraid to take their chances with the similar legal assurances provided to our service people. These are individuals who have made extraordinary sacrifices and often taken enormous risks to serve our country (irrespective of one's political opinions); the least we can do take a risk for them, not penalize them for their service and loyalty, and do right by them whenever and however possible. Finally, if you want to get really philosophical, it is not a stretch to say that without the historical service of our veterans, you and I might not have businesses at all.